The Illinois volunteer infantry troops were assembling in Cairo to guard the crucial confluence of the two great American superhighways of the 19th century — the Ohio and Mississippi rivers. I’m not sure which two regiments were ones described below, but apparently the 8th, 9th, and 10th Illinois were the ones stationed at Cairo during this time1. Note the correspondent refers to the area as “Egypt” — the dominant influence of the great rivers led to comparisons with the Nile, and many southern Illinois towns were named accordingly: Thebes, where it is possible that Dred Scott may have been held in jail briefly; Cairo, of course; Egypt Mills, across the river in Missouri. CAMP DEFIANCE, CAIRO, Tuesday, June 4, 1861. The two principal events of to-day in Cairo have been a Brigade drill, in which about 3,500 of the troops stationed here were reviewed by Gen. PRENTISS, and the arrival of the two regiments necessary to the completion of the Brigade, principally composing the force in this camp. The review passed off pleasantly, and was highly creditable to troops so recently organized. The two new regiments came down from Alton on the Louisiana and the City of Alton, and after their debarkation, formed on the levee, and marched to their barracks to the tune of “Yankee Doodle.” I have seen no Western troops whose general appearance was more creditable; the arms, accoutrements, uniform and discipline were all good, and gave to the stalwart forms of the men a truly soldierly appearance. Perhaps the most really important event, however, is the arrest of two more of the leading Secessionists of Marion, one of them the brother-in-law of LOGAN, the Congressman for that district. Marion is in Williamson County, and is as treasonable in sentiment as Memphis. As I wrote you early in May, a large proportion of the population of Egypt is not only Southern in origin, but Pro-Slavery in sentiment, and Williamson County is a sort of focus for this feeling. Settled by Pro-Slavery families, it is principally controlled in political action by a dozen or two men of wealth and intense hostility to freedom, who own the bulk of the trading capital, control all the whisky shops and banking capital, hold mortgages on the farms, and, in general, constitute an autocracy which would be quite perfect if not restricted somewhat by the laws of Illinois and by the Union. The mass of the people cannot read or write, and vote and act as these men say. Last Fall, during the political campaign, they erected an immense Douglas pole; and this Spring, after the public adhesion of the Little Grant to the Union, they cut down the pole, chopped it into wood, made a bonfire of it, and threw their hats into the flame — hurrahing in the meantime for JEFF. DAVIS! Out of over two thousand voters in the county, less than two hundred voted for LINCOLN and BELL; and nearly all the balance are Disunionists. It was from Marion that the recession company went — some thirty or forty men, instead of the two hundred reported by the telegraph. A company was raised, too, to destroy the Illinois Central Railroad bridge over the Big Muddy, but the enterprise miscarried. So bold were the leaders of treason in Marion — so general the sentiment in favor of the Southern Confederacy, that they defied all attempts at arrest — going armed, and determined to resist all processes by force. But the Captain of a company, stationed at Villa Ridge, under orders from Gen. PRENTISS, went quietly up to Marion with two or three men, met the principal traitor as he was at the depot, preparing to go to Springfield, took him into a room, locked the door, and had him in custody and on the train before he had time to make a show of resistance. 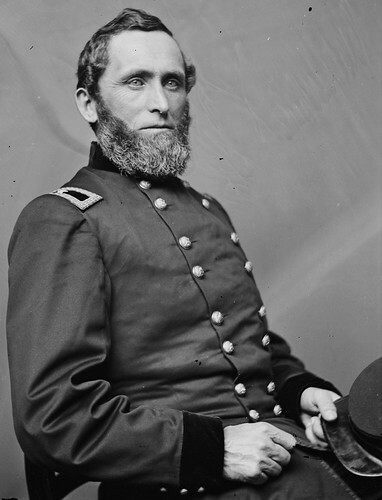 When brought before Gen. PRENTISS, he had lost the most of his bravado, and undertook to reason the case. That officer heard him awhile, and then quietly said that he was charged with treason against the Government; that the evidence would be collected and an opportunity given him for defence; that if found guilty, he would meet the late of those who conspire against the Government of the nation. And so he sent him up to Springfield, and delivered him to the civil authorities. To-day, the telegraph brings word that two more of the gang have been arrested. So we soon look to see the “secessia” of Illinois purged of the mischievous elements which have given it so unenviable a notoriety. A TRIP TO CAMP SMITH. A very pleasant trip to-day was made to Mound City and Camp Smith, by a small party, on invitation of Col. TAYLOR, Mayor of Cairo, on a small steamer of his own. A fair proportion of ladies added interest to the event. We first steamed up to Mound City, a very pleasant spot a few miles above Cairo, on the Ohio, on which some good improvements of, a business character have been made, and which is the rival of the latter town for the future business which it is believed must centre at or near the confluence of these two great streams. We then returned and passed up the Mississippi, about an equal distance, to Camp Smith, where two Chicago companies, one under command of Capt. MIHALOTZKY, a gallant Hungarian, have been stationed as an outpost. We left the camp amidst a salvo of artillery, and with the best of good wishes for the patriotic and brave young fellows who have left comfort, safety and friends, to encounter hardship, disease and danger in the cause of their country. There is no doubt that the rebels have at least 5,000 men in Union City, and that the number is increasing. They evidently seriously apprehend a descent, and are laboring with all their strength to meet it. It It does not appear that BEAUREGARD has assumed command there. He is reported to be in Virginia. It is immaterial to us. The rumor of FREMONT’s appointment excites a good deal of enthusiasm. His prestige alone would add greatly to our strength. The flags here are at half mast on account of the death of Mr. DOUGLAS. 1Morrison, A History of the Ninth Regiment. This entry was posted in Benjamin Prentiss, Illinois and tagged 9th Illinois. Bookmark the permalink.